The inaugural SLBL Pro Basketball League Tournament conducted by the Sri Lanka Basketball Federation (SLBF) and sponsored by Mobitel will commence on May 2 at the Sugathadasa Stadium and Sri Lanka Air Force Indoor Stadium in Colombo 7. This event will feature Sri Lanka’s finest basketball talent including future stars from the age groups of 18 to 23 years. The teams competing in this tournament are Galle Express, Gampaha Jets, Jaffna Crabs, Kandy Kings, Colombo Winners and Batticaloa Sunrise. A total of six Franchise Teams will contest this event with the champions receiving a cash award of Rs. 1 million. A total of 60 players will be selected via an auction to these Franchise Teams. The current basketball players (Men) meeting minimum representative criteria of participating in one of the recently concluded Senior Nationals, Mercantile League ‘A’ Division, and Colombo Super League ‘A’ Division will be eligible for application. The final of the tournament will be worked off during the second week of June at the Sugathadasa Stadium. These details were revealed by Chandana Liyanage, Vice-President SLBA during a media conference held at the Olympic House in Colombo yesterday. 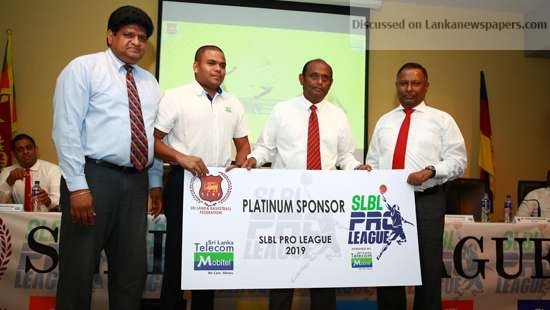 “A professional league was highly due to recognise and remunerate talent and plan is to bring the best basketball players in Sri Lanka, every year, together to compete for SLBL Championship,” said Liyanage, Vice-President SLBF. Further details could be obtained from Chandana Liyanage on telephone: 0769649923 or Paul Newmen on 0773960174.